Here is this weeks’ upcoming Handshake deadlines for jobs, internships and fellowships in Education – click HERE to review them all. There are also many more outside of these deadlines so continue to develop your own searches using keywords and industry sectors. This entry was posted in Midd Blogosphere and tagged Education, education access, Graduate/Professional School, Teaching Residency on April 15, 2019 by Tracy Himmel Isham. Don’t fret if you missed the deadline for internship funding for unpaid internships this weekend. I’ve sorted through Handshake and am including a link HERE to over 70 PAID internships, jobs and fellowships, ranging from working part-time at The Climate Museum on Governors Island in NYC to The National Endowment for Democracy to the Society for International Development. THERE ARE LOTS OF PAID POSITIONS STILL OPEN ON HANDSHAKE! This entry was posted in Midd Blogosphere and tagged Climate Change, environmental services, foreign policy, international development, Internships, Jobs, Nonprofit, Social Impact on April 15, 2019 by Tracy Himmel Isham. Monday, April 22 – EARTH DAY! This entry was posted in Midd Blogosphere and tagged Environment Education, Social Impact, Visual Arts on April 15, 2019 by Tracy Himmel Isham. Sunrise Middlebury would like to welcome you to a Vermont Town Hall on the Green New Deal. The town hall will offer the opportunity to listen to presentations on the Green New Deal for Vermont and the U.S. as well as the Sunrise movement. Participants are encouraged to share stories about the impacts of climate change and discuss what a Green New Deal could mean for Vermont. Many people are inspired by the vision of a Green New Deal. And history has shown us that the sweeping societal change we’re calling for with the Green New Deal can only be won with an alignment of political and social movements that establish the political ‘common sense,’ and advance a shared agenda for society. We know we can’t do this alone! Town Halls are an opportunity to build relationships and power with other organizations and movements who share our values and have interest in the Green New Deal. Click here for the Facebook event page. Location is subject to change and updates will be posted there as the planning process unfolds. This entry was posted in Midd Blogosphere and tagged activism, Social Impact, Social Justice on April 15, 2019 by Tracy Himmel Isham. Come to an info session to hear about how you can join the Center for Community Engagement in a full-time position! 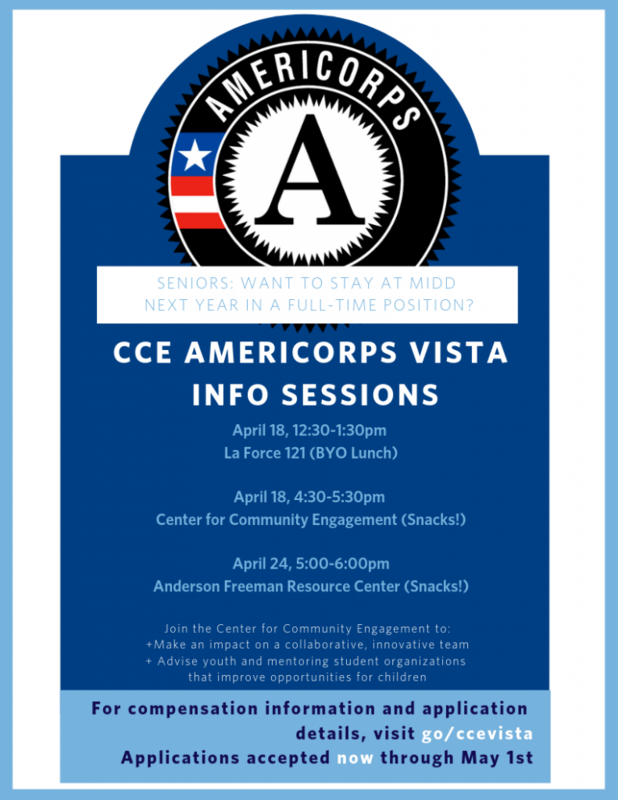 The current CCE AmeriCorps VISTA member and VISTA supervisor will talk about the Youth and Mentoring Programs AmeriCorps VISTA role, what it means to be an AmeriCorps member, and all of the amazing benefits of serving in this capacity for the CCE! This opportunity is available to graduating seniors and is posted on Handshake. This entry was posted in Midd Blogosphere and tagged AmeriCorps Vista, community service, Job, Social Impact, youth engagement on April 8, 2019 by Tracy Himmel Isham. Alumni will be on campus to share their path and professional life with students to help them think broadly about their Biology major and a variety of different career paths during the Field Guide to Biology Majors on Thursday, April 18th. On Friday, April 19th from 9:00AM – Noon, you can sign up for a one-on-one chat with the alumni who have offered to stay this extra day so you can get more personal with them. Click the alumni names below to SELECT A SLOT for a 1:1 conversation. You don’t have to be a Biology major or minor to meet with these alumni. Annalise joined the Intervale Center in Burlington, VT through a partnership with the United States Fish and Wildlife Service. With the USFWS, Annalise works with the Partners for Fish and Wildlife Program on habitat restoration and other land management projects statewide. She brings that expertise to the Intervale Center’s Agricultural Services team, helping farmers navigate Vermont’s new water quality regulations, assess land management concerns on their properties, and find the technical and financial resources they need to implement conservation practices. Gillian is a San Francisco-based sustainability professional who has advanced climate change mitigation strategies across the academic, philanthropic, and non-profit sectors. She currently works as a Sustainability Consultant with Ceres, a non-profit that mobilizes Fortune 500 companies and global investors around climate leadership and advocacy. Prior to Ceres, Gillian was a Climate Research Fellow at the Stanford Woods Institute for the Environment and The David and Lucile Packard Foundation, conducting research and analysis to develop The Packard Foundation’s US$50 million annual grantmaking portfolio on climate solutions in land use, innovations, and energy. At Middlebury, Gillian was a joint major in Environmental Studies and Conservation Biology, and minored in Mathematics. She also holds a research Master’s degree in Plant Sciences from the University of Cambridge, where she was a Keasbey Scholar and published research at the intersection of tropical deforestation and emerging remote sensing technologies. This is a unique opportunity for current students to hear from Middlebury alumni at the top of their fields about how to build a successful and gratifying career. This entry was posted in Midd Blogosphere and tagged Career Exploration, Climate Change, Environmental Conservation, Social Impact, Sustainable Food Systems on April 8, 2019 by Tracy Himmel Isham. Check out some of these Education related jobs and internships with deadlines this week through April 15th. They range from teaching to policy to analysts to Special Education. Click HERE to find them all on Handshake. This entry was posted in Midd Blogosphere and tagged Education, Education Consulting, Higher Education, Internships, Jobs, teaching on April 8, 2019 by Tracy Himmel Isham.